Enzymes Market size was around USD 6.3 billion in 2017 and will witness growth at around 6.8% CAGR up to 2024. Shifting consumer preferences towards packaged and processed foods due to the rising awareness pertaining to food safety & security will be a key impetus for the global enzymes market growth. Incorporation of enzymes in several food products promotes prolonged nutritional content and longer shelf life, thereby augmenting the product portfolio. Additionally, rapid penetration of organized retail in the untapped rural & urban areas will provide strong business outlook through the forecast period. Continuous government support in the taxes & subsidies on numerous food items accompanied by the upgradation of trade practices between several economies across the globe will propel the industry landscape. For instance, free trade agreements including the North America Free Trade Agreement (NAFTA) and Trans-Pacific Partnership (TPP) favour the international trade among several nations. 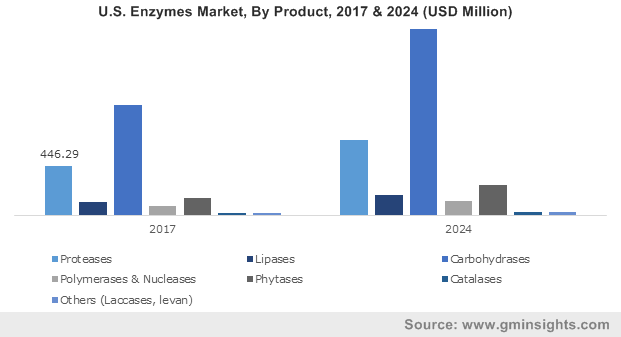 Mass urbanization, changing consumer lifestyle and growing health awareness will provide lucrative opportunities for the global enzymes market size through the forecast period. Food & beverage industry expansion for the growing population requirements along with need to improve food flavour, quality and texture will drive enzymes market growth. Major product benefits in baking products that include standardized bread quality, uniform bread browning, and lower flour protein levels in crackers & biscuits will support industry growth. Potential applications in the detergent industry will also provide positive outlook to the industry growth as they are widely used for the stains removal from clothes. Addition of specific enzymes in the product composition will enhance the effectiveness of detergents and helps in the removal of protein-based stains. For instance, the blood stains removal becomes very easy with the use of a normal enzyme-based detergent. Growing adoption of auxiliary chemicals for enhancing bleaching & deinking and fiber modification will support the enzymes market penetration in the pulp & paper industry. Improved paper quality and reduced energy consumption are the major benefits that will support product penetration over the forecast timeframe. Lack of standardized regulatory guidelines and harmonization will continue to hamper the enzymes market growth. For instance, the EU regulations related to the approval of additives before they can be used as enzymes in the feedstuff will lead to complex situations among the product manufacturers in the region. High product prices as compared to traditional ingredients, particularly in the food & beverage industry, are among the key factors restraining industry growth. Additionally, proliferation of digital media across the globe has reduced the overall usage of paper. Advancements in automation to improve the production efficiency have increased machinery and equipment costs. The initial investment in machinery & equipment for enzymes is high due to the long process involved. The rising demand for reduced possibility of infection, reduced handling costs, user-friendliness, sustainability, and clean & hygienic machinery will positively influence the price trend. However, this in turn will help the company gain competitive edge over the other industry participants and support the market growth over the forecast period. Carbohydrases enzymes market segment is expected to continue its dominance through the forecast period owing to its wide-ranged applications across several end-use industries. Carbohydrase is among the major soft drink ingredients. Increasing demand for sports drinks will have a positive influence over the carbohydrase demand which will boost enzymes market share. Growing applications in animal feed and pharmaceutical industries will provide strong demand growth. Carbohydrases is sub-categorized into cellulose, amylase, pectinase, lactases, and xylanases/ hemicellulases. Amylase is expected to witness highest growth through the forecast period due to its strong ability to bear different temperatures and pH levels. Increasing demand for biofuel applications, specifically for amylases, due to increasing petroleum costs will drive the industry growth. Additionally, the growing demand for renewable energy sources and improved R&D initiatives are supplementing the overall industry growth. Contemporary technologies and patent expirations over the coming years will propel the demand for amylases biofuels, propelling the market size. Food & beverages accounted for the largest market share in 2017 and is expected to witness 7.8% CAGR through the forecast period. It can primarily be attributed to its growing demand for processed food coupled with the rising awareness regarding its health benefits. Significant consumer paradigm shift towards processed food products due to changing urban lifestyle will boost the product demand. Food enzymes market segment is expected to witness strong growth as they are vital in breaking down several complex molecules in the food into simpler forms that can be easily digested. Animal feed enzymes market segment is expected to witness 8.1% CAGR owing to its significant requirement for upgraded feed conversion in animals. Additionally, they improve feed productivity & quality and indicate a positive influence on the animal welfare. The rising demand for high-quality protein coupled with developments of production technologies will provide strong growth prospects for the industry growth through the forecast timeframe. Numerous companies are working on R&D to develop methods to sustainably advance animal feed production process to meet the growing protein requirements. U.S. enzymes market is expected to hold its dominance through the forecast period predominantly owing to high product demand in the food and beverage industry. Growing awareness among population regarding their personal and family health in conjunction coupled with high consumer preference towards processed foods will support the demand growth. Moreover, growing applications in nutraceutical investments in has led to a substantial growth in the pharma sector. For instance, in November 2018, Amano Enzyme introduced PGA 500 to improve the protein solubility at low pH levels. This will help the company gain strong application demand in food & beverage and nutraceutical sector. Asia Pacific enzyme market share will witness gains at over 7.3% till 2024, led by China, India, Japan, and South Korea are expected to contribute significant share of the product demand. In October 2017, China lifted the frozen beef import ban on Australia. Ease of trading across international borders in the region will positively impact the industry growth through the forecast timeframe. Expansion of pharmaceuticals and detergents industry is a key factor that will stimulate the regional growth. 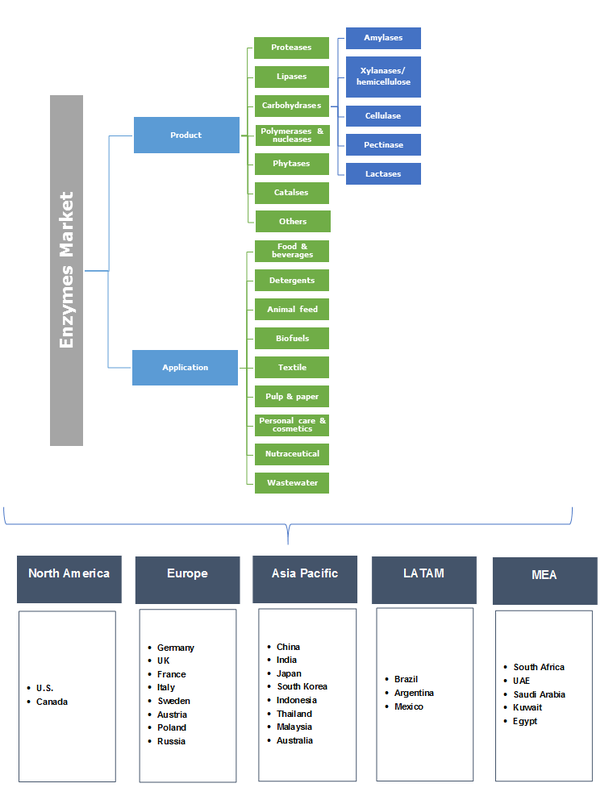 Global enzymes market share is highly consolidated owing to the presence of a few dominating companies contributing significant industry share. Some of the key industry players include Novozymes, BASF, Chr. Hansen Holding A/S, Ab Enzymes, Royal DSM, and Danisco. Industry players are emphasizing on improving their production capabilities and upgrading their solutions to differentiate their services from their competitors. For instance, in October 2012, Direvo Biotech AG introduced innovative manufacturing technologies to improve the economics for the ethanol and livestock feeding industries. As of 2018, Caprienzymes has launched over 30 novel enzymes and ingredients for effluent treatments related to food, textile, leather, and aqua industries. Worldwide, the business is regulated by FDA and European Union for enzymes usage across various applications. Formulators and manufacturers have been facing increasing pressure to improve the efficiency to meet the ever-growing demand from industrial segments such as food & beverage, detergents, animal feed, biofuels, textiles, pulp & paper, etc. The enzyme market participants are expected to observe growing demand from these sectors owing to the need for improving production process efficiency and optimizing the raw materials usage. Utilization of these enzymes would reduce the production time and improve the use of traditional raw materials.